Janet Yellen just took a roundhouse blow to the chin: July durable goods orders rose by an astounding 22.6%, and are up over 33% in the past year, thanks mainly to a surge in Boeing's aircraft orders. This virtually demolishes her meme that the economy is sickly and in need of ongoing, extraordinary monetary ministrations. We know that aircraft orders are quite volatile on a month-to-month basis, but as the graph above shows, the July jump in orders is unprecedented. Orders of this magnitude don't come from an economy that is struggling. This news reflects a global increase in confidence in the future of travel that is simply staggering, and historically cheap borrowing costs have undoubtedly contributed to the euphoria. 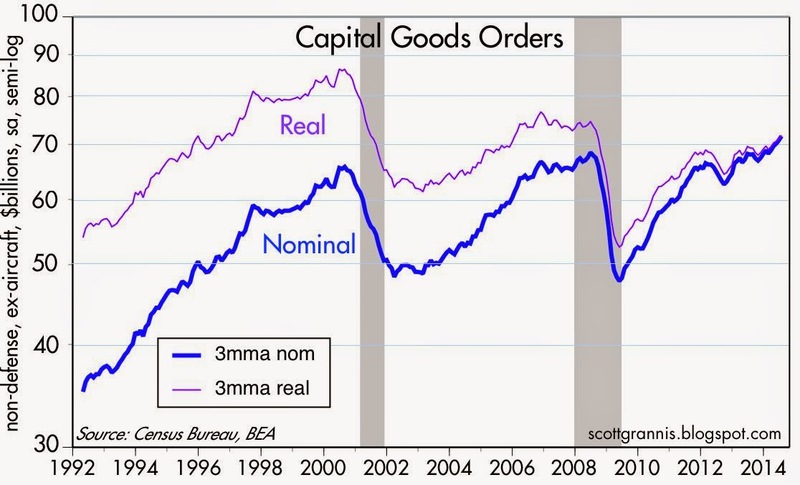 Capital goods orders, shown in the graph above, strip out the volatile transportation and defense sectors, and are a standard proxy for business investment. But even here we see that orders have increased by over 8% in the past year. A few months ago this series was moribund, reflecting a lack of business confidence in the future. No longer. 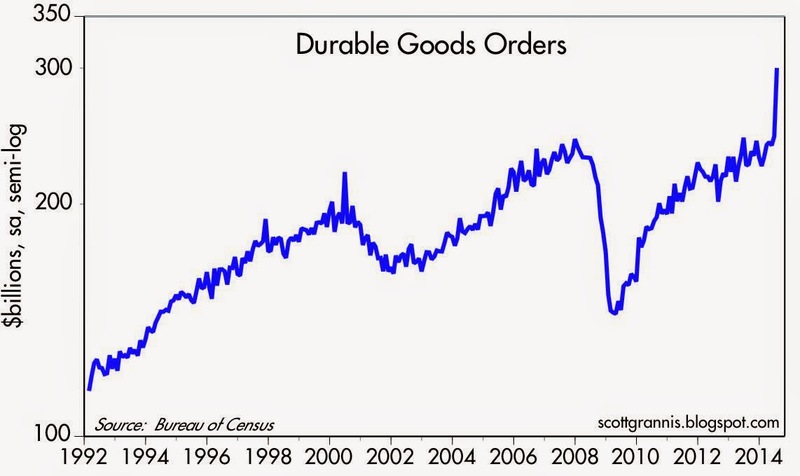 Orders still have a ways to go before reaching new high ground in real terms, but at the current rate that is likely to happen within a few years, if not sooner. This remains the slowest recovery on record, but the economy looks to be on solid ground, and very likely to improve with time. If I were a member of the FOMC I'd be sweating bullets right now. Easy money increasingly looks to have overstayed its welcome. Well, is monetary policy "too easy"? Many have said so, and not for just the past five years. Yet inflation has been in a record low swoon, the economy has lots of slack. Moreover, the USA economy sources globally now--supply constraints are not the issue they were in the 1970s. Nevertheless, Yellen is killing off QE. Milton Friedman said a central bank cannot tighten its way to higher interest rates, at least not for long. Any more Fed tightening may send long-term rates even lower. Could we see 1 percent 10-year US Treasuries? They see such rates in Japan and Germany. Not likely in America--but not impossible either. Stay tuned. I am happy to see robust airliner sales. Bring on more robust sales in every area. I like prosperity. I wish the whole economy was a house on fire, not just one segment. Do you suppose a fair exchange rate on the dollar is helping Boeing sales? Maybe. Meanwhile, Europe is stagnating and facing the Russian bear. Prosperity always answers communism and oppression better than bullets. The hope the Fed and ECB choose prosperity. scott, could that data be a one off? seems to not fit. the behavior of tbonds is astounding irrespective of inflation. really think it has way more to do with supply/demand than macro. there is just so much liquidity earning 0% that SOME of it has to find a new home.